Groups That Don’t Have To Disclose Their Donors Have Already Been Running Ads On TV And Radio About Candidates Who Will Be On The Ballot. LANSING (MAY 10, 2018) — The amount of dark money in Michigan so far this year has already exceeded $1 million. And there are still 180 days remaining before the November general election. 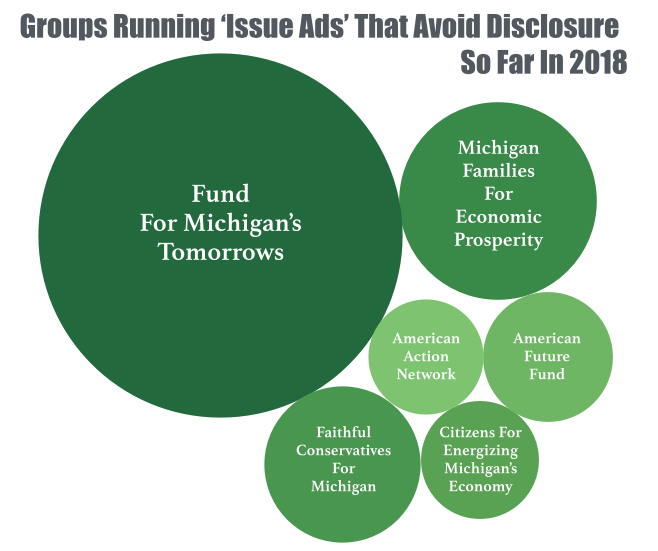 Dark money is political spending that attempts to influence voters but comes from groups, often nonprofits, that don’t have to disclose where they got their money. 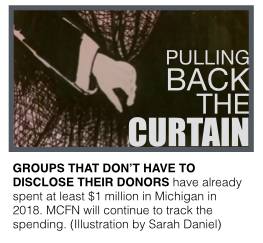 The Michigan Campaign Finance Network (MCFN) estimates that there’s been at least $1.01 million in spending by groups that don’t have to disclose their donors as of May 7. The spending includes ads run on broadcast TV, on cable TV and on some radio stations across Michigan. MCFN arrived at the estimate by analyzing ad-tracking data from Kantar Media/CMAG, reviewing online filings about political ad purchases and visiting radio stations that maintain logs on the political ads they air. However, it’s inevitable that some ad purchases weren’t included because MCFN didn’t review every radio station’s filings. It’s also likely that some ad sales weren’t disclosed by the TV and radio stations themselves. In addition, there’s currently no way to tally spending done by non-disclosing groups on mailers and social media ads that can target voters. In Michigan, political spenders can easily avoid disclosing their donors by not expressly advocating for a candidate’s election or defeat. The largest nonprofit spender so far has been the Fund for Michigan’s Tomorrows, which has been running positive broadcast and cable ads about Attorney General Bill Schuette, who’s campaigning for governor. The group has already aired or reserved time for an estimated $559,000 in ads.The ads don’t tell viewers to vote for Schuette but focus on Schuette’s support for decreasing the state’s income tax and for imposing work-requirements on some Medicaid and welfare recipients. Three other groups have focused on either touting or criticizing Michigan’s incumbent U.S. House members without telling viewers how to vote. The nonprofit Michigan Families for Economic Prosperity has aired ads on both TV and radio criticizing Reps. Mike Bishop, a Republican from Rochester, and Rep. Fred Upton, a Republican from St. Joseph, for their stances on health care. In total, MCFN has tracked an estimated $165,000 in spending by the group, according to public disclosures. American Future Fund has aired positive ads about Upton and Rep. Tim Walberg, a Republican from Tipton, for their stances on online privacy. MCFN has tracked an estimated $71,000 in spending by the group so far. Another national group, American Action Network, which describes itself as an “action tank,” has sponsored positive ads about Rep. Mike Bishop, a Republican from Rochester in January. MCFN tracked about $56,000 in ad spending by American Action Network. Two other organizations have been promoting Republican state Senate candidates (see related story). Faithful Conservatives for Michigan has spent an estimated $103,000, and Citizens for Energizing Michigan’s Economy has spent an estimated $58,000.